Ginger and carrot juice helps improve your immune system thanks to the huge supply of vitamin A and C. A cup of carrot ginger juice provides enough vitamin A and C to meet your entire day’s requirement. Vitamin A helps the stem cells in the bone marrow produce white blood cells, the family of cells that help destroy disease-causing pathogens. Vitamin C protects the cells from oxidative damage. The juice rejuvenates the skin. The vitamin C found in the juice enhances collagen production thus keeping the skin strong by improving elasticity. Carrot-ginger juice is also a good source of vitamin E. Vitamin E helps protect the skin from harmful UV rays and prevents skin damage. 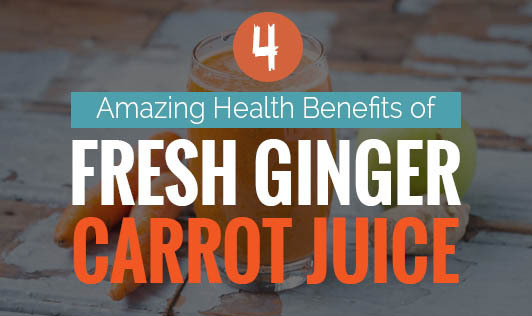 Ginger-carrot juice offers natural protection against cancer. The vitamin C in the juice is associated with reduced risk of several cancers, including stomach and breast cancer. According to a study published in European Journal of Pharmacology, the compound gingerol found in ginger juice promotes destruction of ovarian cancer cells. A study published in the journal- Evidence-Based Complementary Alternative Medicine has also shown that gingerols inhibit colon cancer cell growth thus preventing colon cancer. The juice also benefits cardiovascular health. The compound gingerol found in ginger juice interacts with the protein angiotension II type 1 receptor and regulates blood pressure thereby reducing the risk of cardiovascular disease. The vitamin C in the juice also contributes to cardiovascular benefits by preventing oxidative damage and reducing the risk of cardiovascular diseases and stroke.